As UAVs are making a good place in Wind Turbine’s Inspection industry, engineers and inspectors are collectively working to make Unmanned Aerial Systems for inspection more and more efficient and productive. When UAVs entered the Wind Turbine Inspection industry, inspectors focused on collecting as much data as possible from the wind turbines, and then employed several man hours to identify and locate defective regions. However, now work is being done on developing SMART Analytical Software which can pin point areas in need of attention, recognize defects, bends, damages and identify trends and changes in them. This enables the operators to carry out predictive maintenance and thereby, reduce maintenance and / or repair costs (Ascending Technologies, 2015). Such Unmanned Aerial Systems work on three simple steps. A UAV is used to capture or collect images and videos with the help of different high definition cameras. The UAV is carefully driven by trained operators to ensure that each and every location of a wind turbine is properly captured. Once the data has been collected, a significant amount of time is required to go through all the data by high skilled inspectors, which results in wastage of costly man hours. To avoid this, SMART Analytical Software are designed, which are capable of identifying different types of defects and damages, and maintain their records to develop trends for further detailed analysis. Once the collected data have been processed, highly skilled inspectors analyze the defects and areas which require attention and give well informed decisions to ensure huge savings on repair and maintenance works (Shroyer, 2017). 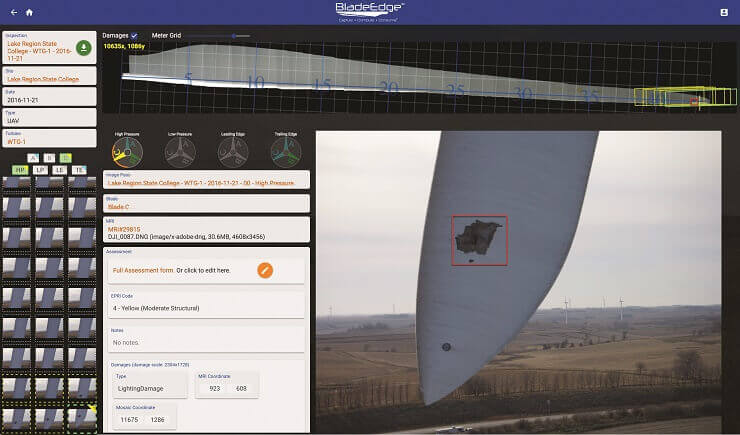 This production of actionable intelligence from drones can benefit, wind turbine operators by saving both time and cost. Such software provide its users with high capabilities of defects identification, maintaining records, developing trends and predicting damages. The use of such software makes a UAS for Wind Turbine Inspection very efficient and accurate. Ascending Technologies (2015). Renewable UK: Cyberhawk Launches Special Wind Turbine Inspection Service. Press Release.